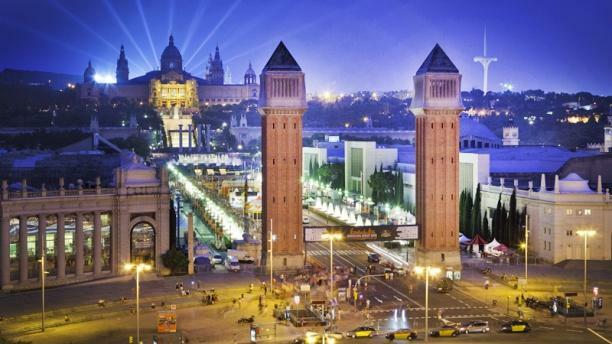 "After its success in London and Dubai, Watatsumi has arrived in Barcelona, located at the top of the refurbished Bullring of Las Arenas. This extraordinary restaurant has a warm and friendly atmosphere, decorated in shades of blue and unique items inspired by the sea, such as an original lamp made of 900 pieces of porcelain, giving it an original touch. Watatsumi delights its guests with its exquisite traditional Japanese cuisine which offers a varied menu with delicious dishes by applying signature touches. From its options you can enjoy daifuku, agadashi and haru maki, as well as the classic shashimis and sushi rolls. Enjoy magnificent views of Montjuïc and Plaza España, while you have a drink and spend an unforgettable evening on the terrace or inside. Watatsumi will meet your expectations." We went to this sushi place due to 360 views and before the magic fountain show! I had a look on trip advisor and reviews seemed ok but mixed but worth a try! We love sushi and eat it a lot so this restaurant was a bit disappointing which was a shame! The service was slow, the hot main came out for my husband before my cold sushi and he didn’t want to eat without me and took themselves another 10mins to bring my sushi out! I ordered the spicy Ebi which consisted of spicy mayo but when I said to the waiter it didn’t have spicy mayo (which was on the menu) he said they don’t do it and brought me chilli sauce! In my eyes the waiter didn’t really know about Japanese food and the ingredients and not so much of a smile or any rapport from either waiter! Won’t be returning but if you want mediocre sushi, mediocre service feel free but check out the view and maybe go somewhere else! Seems like lots of things like rice has already been made in advance waiting for its turn to go to the table because of that it was dry outside and normal inside, dry chicken like from the microwave, rice with no taste. All the dishes comes very quick that makes me believe that it was plated in advance already, which is awful. No explanation about the dish from the waiter; the only good thing is the view to placa espana. Won't recommend this place. Thank you for your review. It's sad to know that you were unhappy with the quality of food and service. We always do our best to meet the needs and expectations of our clients. We are sorry that we haven´t achieved it this time and hope you visit us again and change your opinion. Un Sushi buenisssimo !!! Repetiremos seguro. Gracias por compartir su experiencia con nosotros! Nos alegramos de que le haya gustado nuestro sushi y esperamos verle pronto. Gracias por compartir su experiencia con nosotros! Nos alegramos de que le haya gustado el sushi y esperamos verle de nuevo. Gracias por compartir su experiencia con nosotros! Esperamos verle de nuevo pronto! We loved the food, the setting and the service. We would definitely recommend it! divertida, tranquila y sin problemas. Muchas gracias por compartir su experiencia con nosotros. Esperamos verle de nuevo! Muchas gracias por compartir su experiencia con nosotros. Nos alegra que le haya gustado y esperamos verle pronto!